On first glance the crane badge would appear to be Chinese, but on closer examination the Vietnamese attributes are evident. 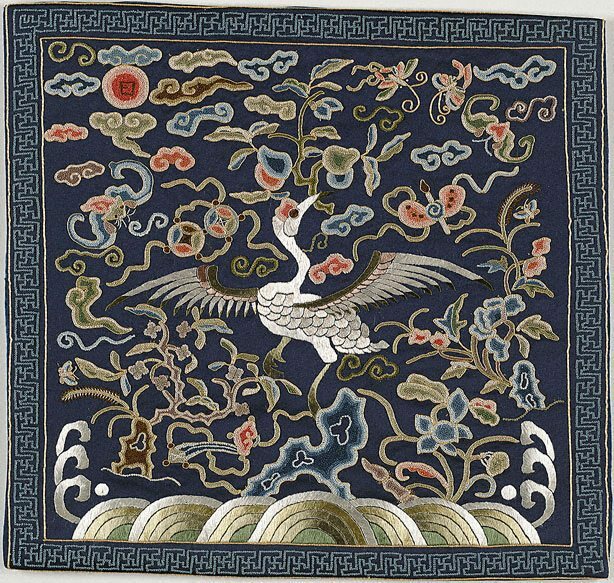 The seven water mounds at the bottom of the badge, the sprig of peach tree with peaches, the wealth symbol on the left of the crane and the calligraphy brush are all classic Vietnamese iconography. The bird and the waves are embroidered in satin stitch and the remaining embroidery is tiny knot stitch. It seems probable that these type of badges were produced at embroidery workshops in the southern part of China to Vietnamese patterns.